Compare car tyres in New Zealand at Canstar Blue. Michelin, Bridgestone, Dunlop, Firestone, Goodyear, Hankook and Kumho were compared on value for money, life of the tyre, wet weather handling, dry weather handling, stopping ability and overall satisfaction. Canstar Blue research finalised July 2018 and published August 2018. New tyres don’t come cheap and can often feel like a grudge buy. But, nearly two thirds of the people we recently surveyed admit they did no research or shopping around prior to buying new tyres. 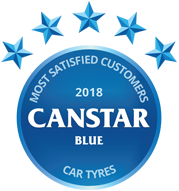 So, while you can get advice from a number of tyre manufacturers and retailers, Canstar Blue asked consumers what drives their satisfaction when it comes to car tyres. For 2018, the Canstar Blue Customer Satisfaction Award goes to Michelin. An incredible 75% of travel on New Zealand’s roads is by what the Department of Transport term as ‘light passenger vehicles’ – cars and small vans to the likes of you and me. If you then consider there are nearly five million vehicles on our roads and over three million of them are light passenger vehicles, that’s a lot of opportunity for accidents to happen. Thankfully, maintenance issues, such as old or worn tyres, are very rarely the sole cause of accidents, but unfortunately, they can make a huge contribution to making a bad situation worse. Worn, or bald tyres as they are commonly referred to, have far less capacity to grip the road so if you are driving fast, travelling in wet conditions, on unsealed roads, or have to brake suddenly, your car is not going to respond well and you may even lose control as a result. One thing that is a constant with tyre tread is the minimum legal depth of 1.5mm that you need to drive on New Zealand roads. How long the tread on your tyres lasts really depends on your vehicle, how and where you drive it but it’s your responsibility to make sure they measure up. In another recent Canstar Blue survey we asked people if they knew what the minimum legal tyre tread is in New Zealand and 37% of people said they did. Worryingly, when probed, 15% of those people then gave the wrong answer. This could prove a costly error because if you are caught driving with tyres that don’t measure up, you could be slapped with a hefty fine. For safety and the sake of your wallet, it’s important that you check your tyres regularly – about once a month is good. You don’t need any expensive gadgets to do it, you can simply place a 20 cent coin in the tread and if you can see all of the two and the zero, you should be thinking about buying new tyres. 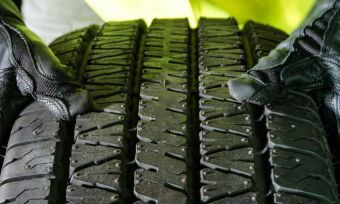 Another thing to regularly check is the tread wear indicators that go around the side of your tyre. If the tread is worn down to these little triangle shapes, you definitely need new tyres. A major cause of premature balding or losing tread is not having the correct pressure in your tyres. Our survey revealed that 59% of people regularly check their tyre pressure which is great because apart from prolonging the life of your tyres, keeping them pumped up can also help with fuel economy. The correct tyre pressure is dependent on the type and size of vehicle you drive and if you are not sure what the correct pressure is for your car, take a quick look inside the driver’s door, fuel flap or manufacturers handbook for a sticker or plate that should have all the details on it. To check your tyre pressure you will need a special pressure gauge. If you don’t have your own device, one of the easiest ways to check your tyre pressure is at your local fuel station. Most stations have an air pressure gauge that is quick and simple to use but always remember to check pressure when your tyres are cold as the pressure will be higher when it is warm. Don’t forget that you should always check all tyres (including your spare), not just the one that may look a little flat. If you can’t find what your tyre pressure should be, or you are struggling to check the pressure yourself, visit a local car tyre retailer, or even a local fuel station, as they should be able to help you. Another important aspect of keeping your tyres in tip top condition is regularly checking the alignment and balance. In very basic terms this is making sure your tyres are in the right position and their weight is evenly distributed. Normal day-to-day driving and unremarkable events such as driving over a small pot hole or even a speed bump can minutely alter the position of your wheels, which over time, may mean your tyres getting unevenly worn. The classic sign that your balancing may need adjusting is that your steering wheel will shudder at a certain speed and then seem to recover if you accelerate or slow down. For wheel alignment, keep an eye on your tread. If it is being worn down more on one side, get things checked out by a local tyre fitter or garage. Buy tyres in pairs: A car needs to be stable with four good points of contact – a vehicle with unevenly worn car tyres on the same axle will be imbalanced and have reduced traction and control. For this reason, it’s usually in your best interests to replace the front or rear tyres as a pair. New tyres on the rear first: Many commercial vehicles are front wheel drive, so front wheels will often wear down faster as they are subjected to the brunt of tractive, braking and steering forces. Yet, even if it is the front tyres that need replacing, you should almost always put the new tyres on the rear axle and move the old rear tyres to the front. Why? Because the back tyres are responsible for vehicle stability, and a loss of rear traction can lead to fishtailing and spinouts, particularly in wet and slippery conditions. Check brake pads: While this one is not technically a tyre tip, replacing a car tyre is a great opportunity to quickly ensure your brake pads still have plenty of grip on them. The most important message of all is that you shouldn’t take any chances with your car tyres. Your life, the life of your passengers, and other road-users, depends on it. If in doubt, consult a mechanic and replace those tyres. Canstar Blue commissioned I-view to survey 2,500 New Zealand consumers across a range of categories to measure and track customer satisfaction. The outcomes reported are the results from customers who have purchased new tyres in the last 18 months, in this case, 1,116 New Zealanders. Millions of tyres are illegally dumped every year in New Zealand, which has adverse effects on the environment. 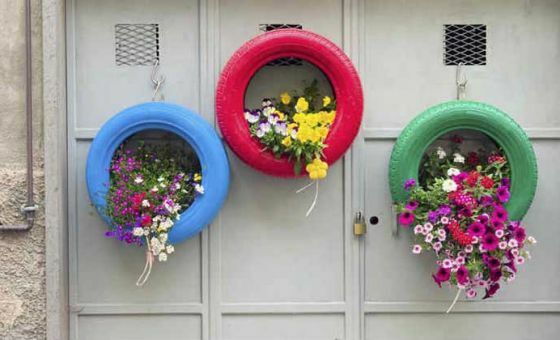 Find out how to recycle your tyres responsibly. Fuel-efficient tyres have a low rolling resistance, which means they minimise the amount of fuel required to move the car. But are they worth the cost? Accidents can and will happen, so it’s best to be prepared. David Basha gives his top tips on checking for tyre leaks. If you think your tyres are expensive then take a look at the hefty price tag on these tyres.